Sometimes teachers feel like all they are doing is pushing and pulling students to learn. Help them learn how to motivate students to learn. In this 6 page teacher training worksheet you will look at five connections to make that increase students' motivation to learn. This worksheet can be done by an individual teacher but it would also be good to do with a partner or in a group setting wherein the questions are discussed. It could even be used as a series. You could use one of the five points per meeting. To motivate students to believe in absolute truth, teachers must present them with a God big enough, great enough, powerful enough, and wise enough to have the final word, to be the ultimate standard, to have absolute authority. 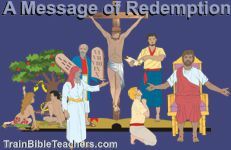 This 2 page teacher training worksheet, challenges teachers to make teaching of the Word more about the God of the Bible than the stories or commands.